I don't like mince pies! Store-bought mince pies are loaded with sugar, so sweet that I felt sick after ONE bite! By this time of the year, everyone is looking for the best mince pies in the market. And I heard that Marks and Spencer's mince pies are the best! Comes November, my friend would be looking hi and lo for Marks an Spencer's mince pies. And MS mince pies don't stay on shelves for long... the turn around time is so quick... you snooze , you lose 😱, and you will be without any pies for Christmas. She used to vent out her frustration when she couldn't get any! Christmas without mince pies will be like Eid without lemang :(. ...and you might be wondering why am I baking mince pies, since I don't like mince pies? Hubby was surprised that I wanted to bake mince pies.. he too not a great fan of mince pies. Well... I came across a mince pies recipe from an old magazine cut-out. I believe its was from Prima magazine. "Once you've made this mincemeat, you'll never want to buy the ready made-kind ever again!" That statement just cried out to me... I MUST try. I am so glad that I tried baking these mince pies. I reduce the sugar by 75% in the mincemeat. The sweetness was just right. The pastry was good too, soft and crumble in the mouth. Recipe yield 48 mince pies. I do not own a mini pie tins so 24 holes mini muffin pan was used. Mince meat is enough for 48, only 1 heap teaspoon is needed to fill up each pie. Halved the dough recipe if star shape pie topper is used. Place sultanas, raisins, figs, apricots and apple in food processor and process until coarsely chopped. Transfer to a glass bowl (with cover) and mix in the rest of the ingredients. Mix flour and almond meal in a mixing bowl. Add cold chopped butter and rub flour, almond meal and butter in breadcrumbs. Add icing sugar, lemon zest, egg yolks and milk. Rest the dough in the fridge for 20 minutes. Using non-stick mini muffin pan (24 holes), roll out pastry, cut out 24 discs and line the muffin pan.. Fill each pie with 1 teaspoon heap of mincemeat. Roll out another dough and cut out another 24 discs or stars, to cover/ top the mince pies. Dampen edges and press the tops. Those are beautiful. 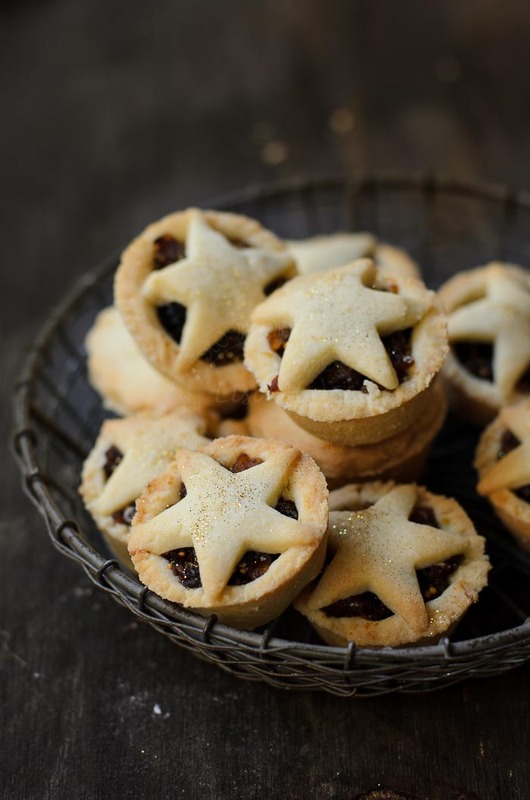 I have never tried a mince pie but maybe I will have to make these because they look great! For the mincemeat, the final ingredient listed is 1/2 teaspoon mixed spice... what is the mixed spice(s) that I should be using? I made these and they were a big hit. However, I have to confess I cheated. I used store bought premade dough and mincemeat! Thanks though for the idea.